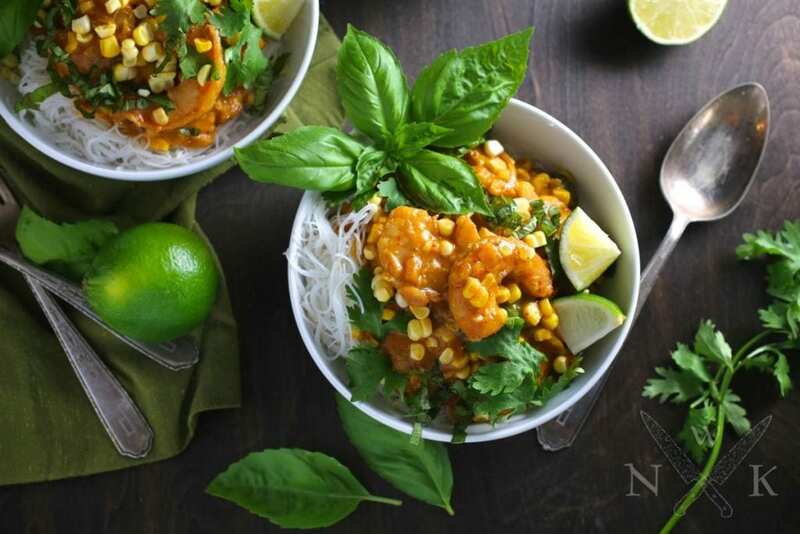 Shrimp curry is easy to make, and we flavor it with coconut milk and add fresh corn for a summery touch, but you can make this all year round! While I love hot dogs and hamburgers and all those great American summer favorites, I find that by August I’m actually kind of bored of them. That’s when I crave something completely different, something that will wake my tastebuds right up. 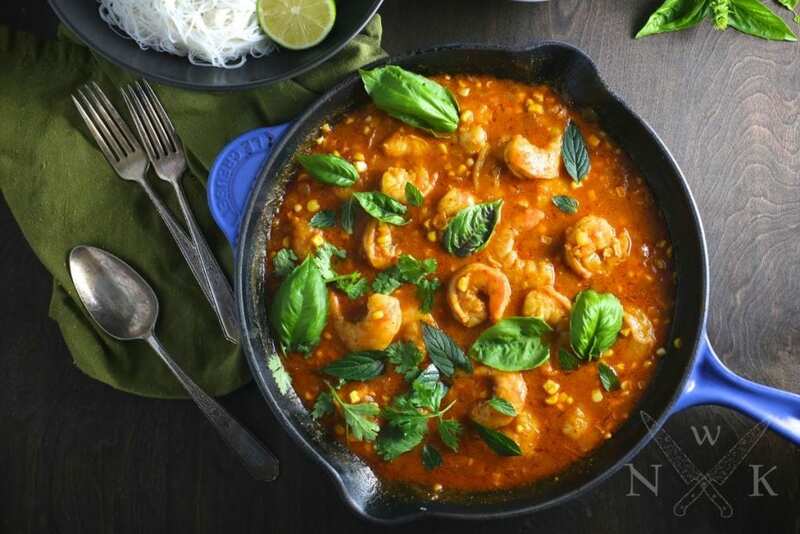 Something like this fiery red shrimp curry, made silky by coconut milk and topped with lots of bright herbs like mint, basil and cilantro. 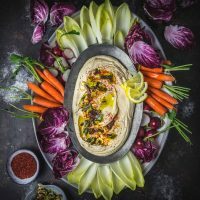 We made it with wild-caught North Carolina white shrimp because they looked amazing at the market but you could easily swap them out for chicken thighs or breasts (cut into large bite-sized chunks), tofu, even chickpeas would be a delicious vegan option. Sweet corn is in peak season right now and while it lasts I add it to just about everything, but it really does work incredibly well here. Corn and shrimp are a classic pairing but with the curry sauce, it’s crazy good. If fresh corn is not in season, frozen works perfectly well, too. Of course you could serve it with rice but I think it’s even better with vermicelli rice noodles. They have a wonderful springy texture and somehow just feel lighter than a bowl of rice. Perfect for a hot summer night. Best of all, they can be cooked ahead and simply dunked into boiling water to be re-heated. 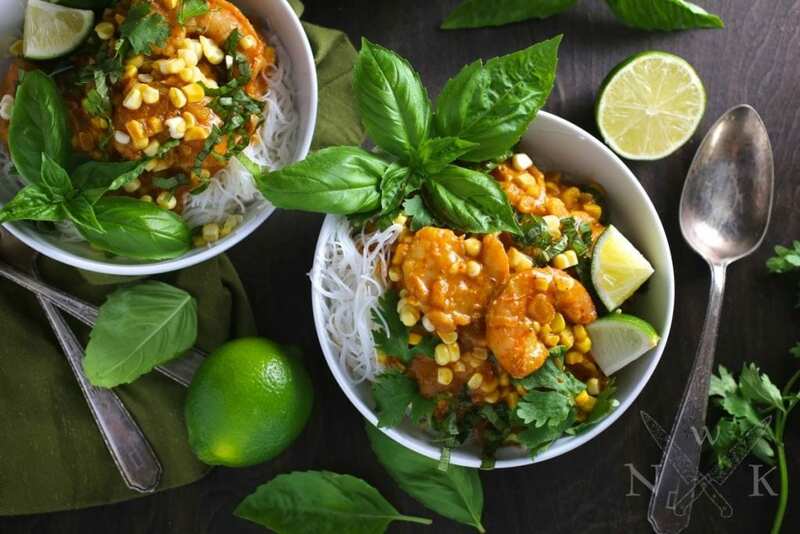 If you don’t cook a lot of Asian food, this shrimp curry recipe might have a couple of ingredients that are unfamiliar to you but, depending on where you live, they should be pretty easy to find in most large grocery or specialty stores. Of course there’s always the internet if you can’t find what you need locally. Most people are probably familiar with coconut milk, which is a staple in Thai as well as many other South Asian and Caribbean cuisines. Make sure you buy unsweetened milk. Light versions are fine. I’ve always wanted to make my own red curry paste, but the jarred versions are usually quite good and the short-cut keeps this dish firmly in the “Weeknight Quickie” category, which I really appreciate. Red curry paste is usually a mixture of dried chilis, galangal, garlic, lemongrass, shallots, shrimp paste and lime zest. It’s on the spicy side but not burn-your-mouth-off hot. I usually add a tablespoon and taste the sauce, adding more if I want it spicier. 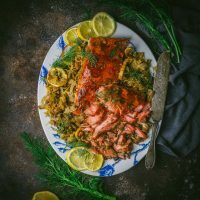 Fish sauce is one of my favorite ingredients and I use it all the time, in all kinds of dishes (for example; a little splash in our French Onion Soup with Garlic Butter Croutons). A little goes a long way but, like anchovies, it adds a salty depth of flavor that is so good. My favorite brand is Three Crabs. If using chicken instead of shrimp, cut it into 2 inch cubes and simmer it gently in the sauce until chicken is cooked through (about 10-12 minutes). Zucchini and red peppers would be great additions. Slice them about a half inch thick and cook them along with the corn. They should be crisp-tender by the time the shrimp are done. Use defrosted frozen corn if you can’t find fresh. Peeling and de-veining your own shrimp is easy and saves money (avoid the ethically and environmentally unsound shelled/cleaned varieties). Save the shells in the freezer to make shrimp stock! I love the flavor of cilantro, mint and basil mixed together for a shrimp curry but use whatever combination you like best. Cook rice noodles according to package directions, then drain and rinse well with cool water. Set aside. Keep a pot of boiling water on stove for reheating noodles later. Melt coconut oil in a wide skillet over medium heat. Add onions and cook until softened, about 5 to 8 minutes. Add curry powder, curry paste, garlic and ginger and stir everything together, cook for 2 minutes more. Add lime zest and juice, honey, fish sauce and coconut milk. Add corn and stir to combine. Simmer gently for 5 minutes, stirring every so often until the sauce thickens slightly. Season shrimp with salt and pepper, add to pan and simmer gently until shrimp are just cooked, 3 to 4 minutes. The shrimp should be just barely opaque where it’s thickest. Dip noodles briefly in hot water to reheat, then drain and divide among bowls. Spoon shrimp and sauce over each serving. Garnish with cilantro, basil and mint leaves and a wedge of lime. NextChickens! Episode 3: More Chickens. Thanks Stephanie! Green papaya noodles would be amazing! Just finished making and eating this dish – I can safely say it’s the best thing I have ever cooked for myself. I used thicker pad thai style noodles in place of the thinner rice noodles. Thank you so much for sharing it, it will definitely become a regular in my lineup. This looks absolutely delicious Emily! I agree, it is a great departure from standard summer fare… but then I am always up for a good curry! I can’t wait to try it! Tis looks so yummy! So happy to have found you guys! I love Thai curry, so I’m thinking of giving this a go, but it says to use 1 tbsp of curry powder, & that’s Indian… Doesn’t that override any of the Thai curry taste, considering how strong of a flavor it is? Hi Emily, the added curry powder mostly gives an added hit of cumin and coriander. The dish still tastes Thai, but it adds another layer of spice. You could certainly leave it out though, if you wanted. 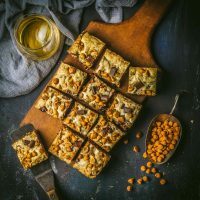 Hi, I want to try this recipe but we have an allergy to coconut. Can you suggest a replacement? Allergy is to all nuts and seeds. Thank you! There is quite a bit of coconut milk in this recipe, as it’s the basis of the sauce. 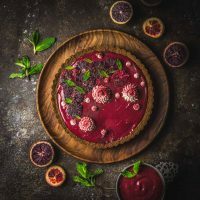 You could use a combination of cream, yogurt and stock to give you a creamy sauce, without the coconut. I’m not sure of the ratios, but you want a moderately thick sauce.